This recipe came from my mother-in-law. It’s one that has been in her family for sometime now. Being a non-kraut lover, I was skeptical as to whether or not I’d like this, but from the first bite I was won over. A delicious and hearty recipe, but few ingredients. Can be baked in the oven or cooked in a Crockpot. 1. Coat pork with chili powder. 2. Open your cans of Sauerkraut (drain liquid) and season with the chili powder as well. You want enough chili powder to turn the kraut a nice reddish color. 3. Combine the two ingredients together, in your baking dish, and bake at 350 degrees. Cook until meat is tender and pulls apart, easily, with a fork. If you want your pork to cook quicker, cut pork into nice size chunks and distribute throughout the kraut. This makes it easier for dishing and serving. coated in the chili powder. This recipe should be served as the main dish or as a meal. This recipe can be adjusted to feed many or few. 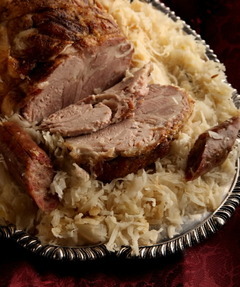 I’ve done pork roasts with kraut in the crockpot. I usually throw in caraway seeds. I don’t know if I tried caraway or not, what does that taste like? I know for sure the chili powder gives this such a delicious taste. It can be addicting LOL.